I love Gabe and Audrey. Audrey is a strong and assertive woman and she does it with the sweetest southern girl smile on her face. Gabe is a stickler for the rules. The rules say he cannot have Audrey. Good thing for Gabe, Audrey doesn’t care too much for rules. The hunt for Audrey’s brother is tense. The H/h are in danger most of the book. Ms. Burrows does not pull any punches. The violence you would expect to find in a book about hostages and rescues is accurate. She gets the point across without being gruesome. I do not see how anyone could read this and not root for Gabe and Audrey. Great start to a new series. 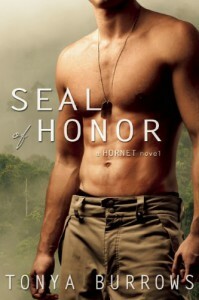 Looking forward to more HORNET in my future.